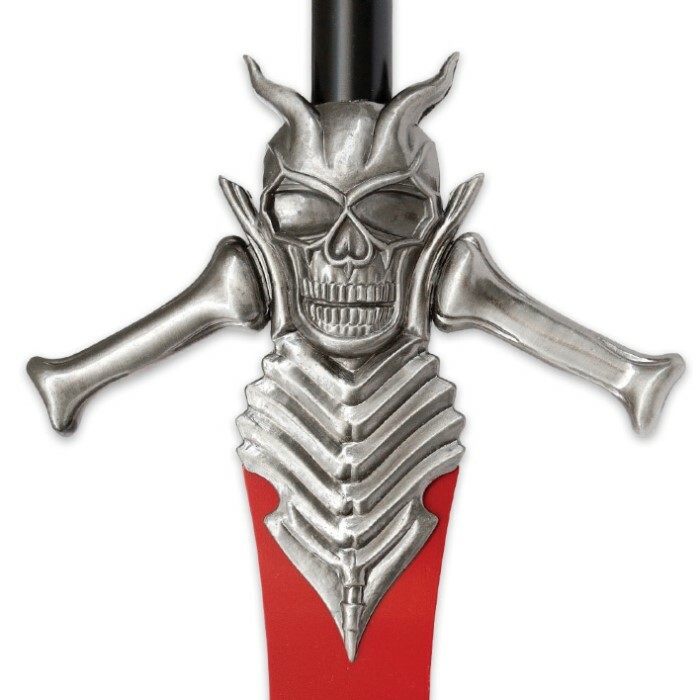 Demon Rebellion Sword Reproduction | BUDK.com - Knives & Swords At The Lowest Prices! Do you think you can wield Dante's mighty Rebellion? Give it a try by adding this quality replica to your collection. The magical blade is 36 1/4 " of double-edged stainless steel. 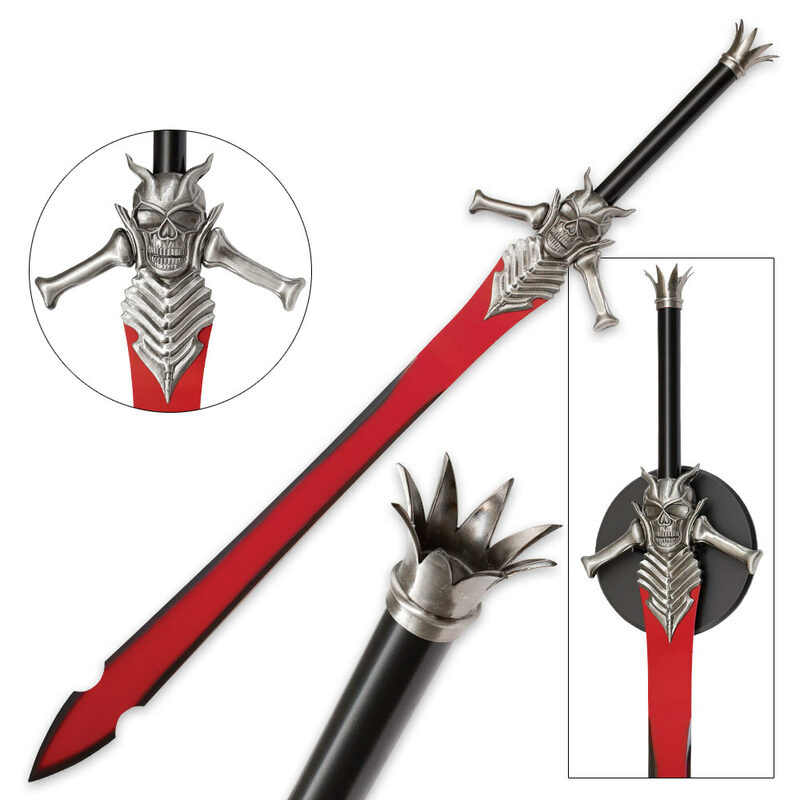 The 3D guard and collar has the ribs and skull design that is particular to the demon warrior's sword. It is all metal construction and comes in at a whopping 50" overall length. Impressive, but not quite ideal. Massive and centerpiece-worthy, this eyecatcher is a thing of beauty and is indeed richly detailed. I give kudos to TrueSwords for their honesty regarding the state of this weapon as seen in the item description. 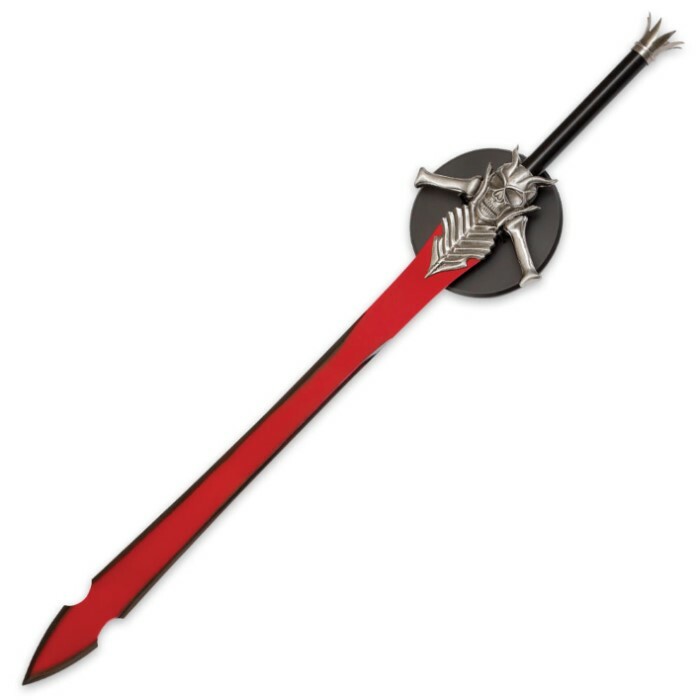 My blade has a scratch running down the center of its backside, and the handle does have some play, but it is not to the extent that the weapon would break. The blade also bends underneath its own weight, but that can be expected from any sword of this size. Concerning the spiked pommel, I ask future buyers to exercise caution. It is deceptively sharp and would hurt someone long before the actual business end ever would. The flaws are evident in this beast, but don't let them dissuade any thoughts you may have. For a gaming fan or a weapons collector, one cannot go wrong with this. I am so glad made this purchase. Good size and weight. The blade isn't sharpened but it's made to hang on the wall. But it can easily be sharpened if you want it. this thing is awesome, the handle feels sturdy and the weight will work well for training. the point is pointy but the blade is flat. it could be sharpened if you wanted to, but there are other swords to buy for such things. Its his blade from the anime, tho the horns are a bit shorter, the blade hild seems a bit split but nothing to noticable. The paint on the handle is wearing out tho. The blade does seem to wable a bit. For what it is, its not bad. When i got it the hand guard was loose, but barely. The blade is a little wobbly, but thats just because of how long it is. Even that isnt bad enough not to buy it for a collectors. As far as functionality, i wouldnt swing it around. The crown is pointy, and its all tip heavy. When I placed my order, the status was listed as sold out, so I expected a rather long wait. What I did not expect was a phone call the next day from True Swords letting me know they did have a limited stock, but warning me there were imperfections leading to a loose blade guard. I said that wasn't a huge issue and it was fine if they sent one of those. I got my sword two days later, bright and early in the morning. I have to say the quality is great, it's a little heavy, but not overly so, and the loose blade guard is barely noticeable. Overall this sword is beautiful and I'm so glad to have gotten it much sooner than expected, and to add it to my collection. Thanks again, True Swords for another great customer service experience!